WBC heavyweight champion Deontay Wilder (40-0, 39 KOs) has finalized a deal to face former unified titleholder Tyson Fury (27-0, 19 KOs) on December 1st, according to a press release that has been issued by the Premier Boxing Champions. The fight was announced as a pay-per-view event yet there was no network specifically mentioned, nor a venue for the fight. ESPN sources suggest that’s because a venue hasn’t been finalized just yet, but that both the Staples Center in Los Angeles and the Mandalay Bay Events Center in Las Vegas are being considered. What was mentioned, however, is that Wilder and Fury will be embarking on an international press conference tour which will make stops in London, New York, and Los Angeles, although dates for those events weren’t specifically outlined at this time either. Fury, 30, will be attempting to recapture a major world title after a two year hiatus and a couple of tune-ups. Wilder, 32, enters this fight with his confidence at an all-time high after besting Luis Ortiz earlier this year in an epic battle. He then entered into negotiations with unified titleholder Anthony Joshua to stage an undisputed heavyweight title unification, but that all collapsed for the time being, leaving both fighters to look elsewhere. 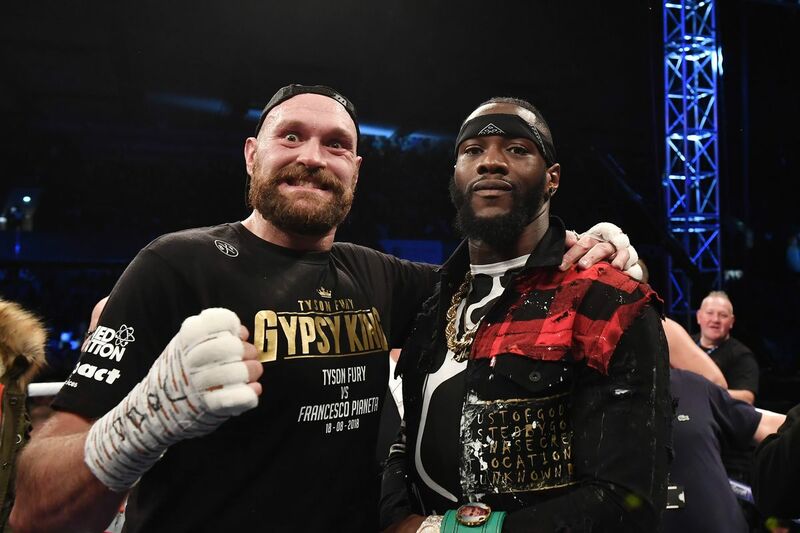 Wilder in particular wasn’t happy about what he perceived to be bad faith negotiations on Joshua’s part, leading to Joshua’s fight date with and his R7 demolition of Russia’s Alexander Povetkin, Saturday, at an 80, 000-capacity Wembley Stadium. Well, now that Joshua has put out Povetkin’s lights, the Fury-ious Tyson seems to be the only man standing in the way of the potential, mouthwatering H-U-G-E money-maker between America’s WILDER and Britain’s JOSHUA at a date and venue yet to be determined.